My new book, written with Patrick Lambe, is now available for pre-order. In addition, readers of this blog can avail themselves of a 20% discount by quoting the code below. 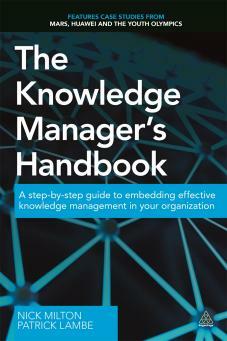 The book, entitled "The Knowledge Managers' Handbook - a step-by-step guide to embedding effective knowledge management in your organisation", is a companion volume to last year's book "Designing a successful KM strategy - a guide for the Knowledge Management professional" written in partnership with Stephanie Barnes. dealing with the inevitable bumps in the road. The book contains a preface by Larry Prusak, and 5 case studies from a range of organisations illustrating their KM implementation story. Regular readers of this blog are entitled to a 20% discount when ordering the book here. Just enter the code KMHKNOCO on the check-out page (the code only works when ordering from the publisher - do not try it on Amazon or any other online reseller). Publication date is Sunday April 3rd. If you are not a regular reader of this blog - perhaps you should be! Subscribe using the buttons to the right, and receive a daily stream of stories and insights which are not yet in ANY book. My name is Jorge Blanco. I prefer the Kindle edition of the book. When it is going to be available? I am a graduate professor and want to evaluate your book for the course of Knowledge Management (I already use in my class your other book: "Designing a successful KM strategy". You can even see my recommendation of that book in Amazon. I really enjoyed it. By the way I once sent a request for information to negotiate a licensing agreement for the "Bird Island" (in the Knoco website) to deliver workshops in Mexico and Latin America. Nobody contacted me at all. My company is "Glumin Networks SC" and my business e-mail jorge@glumin.com. We design and deliver business simmmulations and we deliver business simulations of others, like the ones from Gaming Works, a Dutch company, leader in IT best practices simulations. I will be pending on the news of the book in electronic format for my students as well as somebody from Knoco to contact me about the Bird Island.